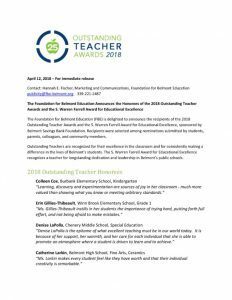 The Foundation for Belmont Education (FBE) is delighted to announce the recipients of the 2018 Outstanding Teacher Awards and the S. Warren Farrell Award for Educational Excellence, sponsored by Belmont Savings Bank Foundation. Recipients were selected among nominations submitted by students, parents, colleagues, and community members. The ceremony to honor this year’s recipients of the Outstanding Teacher and the S. Warren Farrell Awards will be held on Tuesday, May 1, from 6:30–8:00 PM at the Chenery Middle School. The award celebration, sponsored by Belmont Savings Bank Foundation, is open to the public.